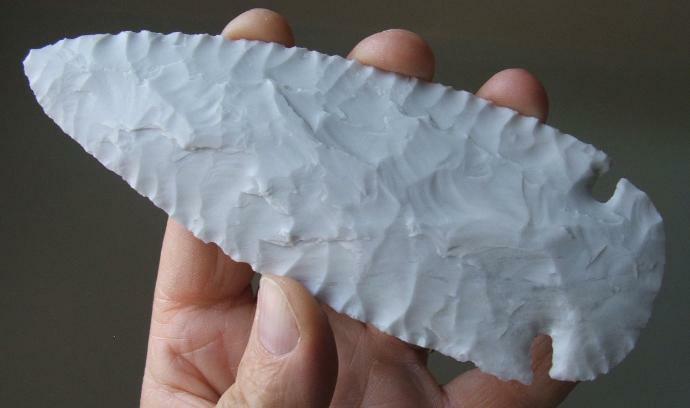 region known as the Great Basin to make knives, spear and dart points, and then arrowheads in the last 1,500 years or so. sharp implement, and enhances the natural colors of the stone. price specified either here on our web site or in our periodically produced "New Stone Age" catalogs. 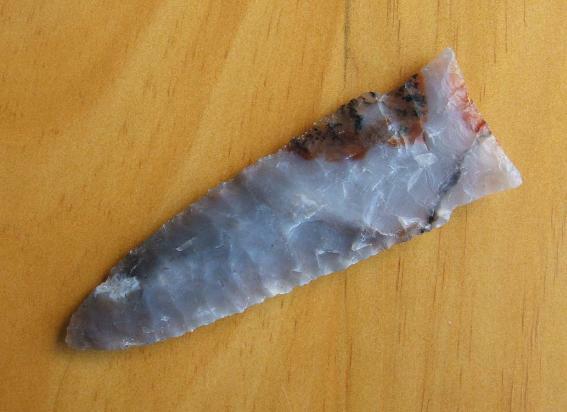 Paleo-Indian "Scottsbluff" Style Spear Point of Paiute Agate -- 2008 A.D.
Classically shaped and pressure flaked Paleo-Indian period Scottsbluff style spear point. 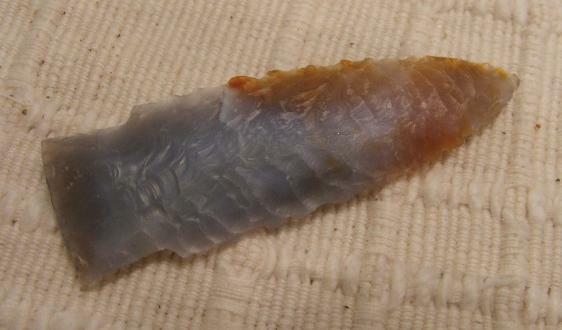 Paleo-Indian "Scottsbluff" Style Dart Point of Paiute Agate -- 2007 A.D.
Paiute Agate "Scottsbluff" Spear Point -- 2007 A.D.
pressure retouch for the final sharpening. 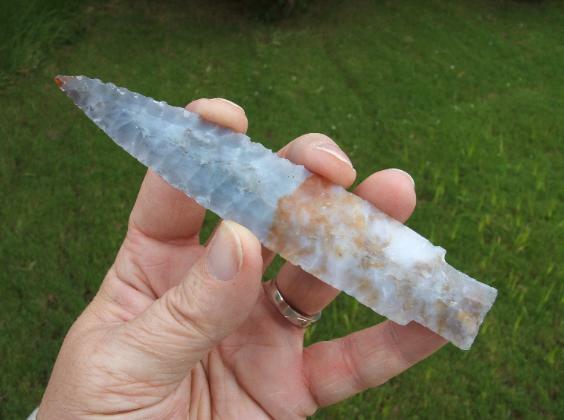 Made of white Novaculite from Arkansas. 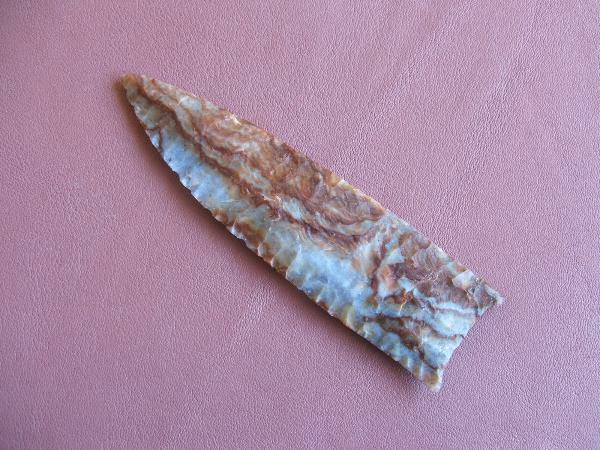 Made in 2006 A.D.
Paleo-Indian "Plainview" or "Black Rock Concave" Style Lance Point of Paiute Agate -- 2008 A.D.
heat treated, colorful Paiute Agate from eastern Oregon. Made in 2008 A.D. 4-3/4" x 1-1/4". 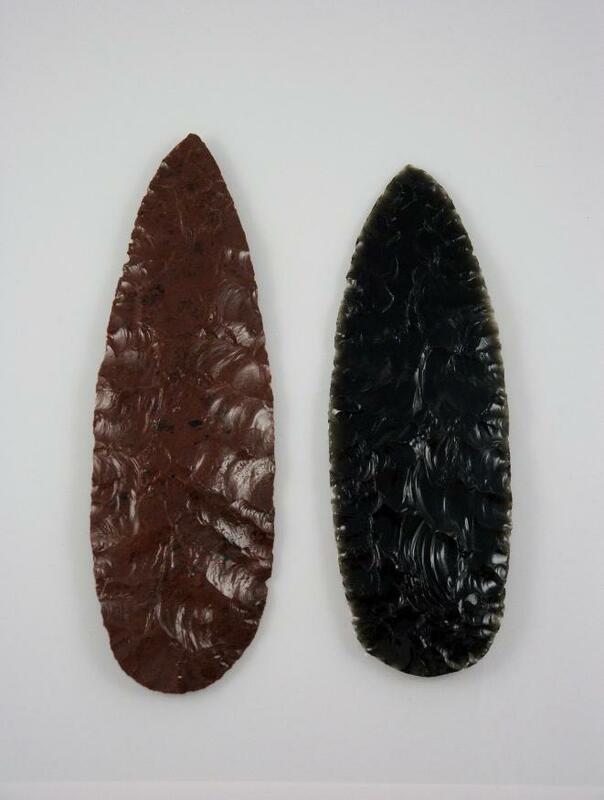 Two Archaic Style Lanceolate, Un-Notched, Ceremonial Style Blades -- 2005 A.D.
of brown obsidian from Glass Buttes and black obsidian from Riley in eastern Oregon. Made in 2005 A.D.
8" long by 2-1/2" wide. 7-1/2" long by 2-1/2" wide.